This fantastic comedy show is a display of the BEST comedic talent in the both Huntville and across the United States. 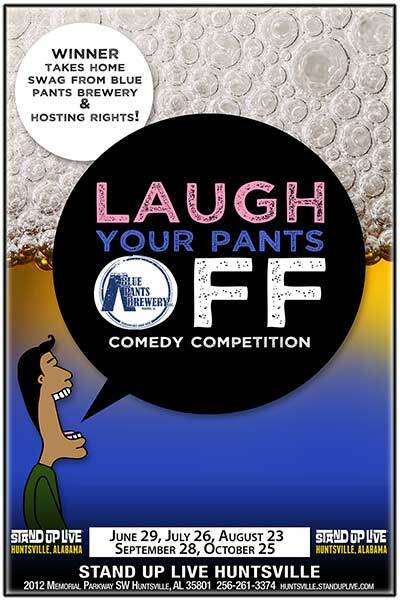 Each comedian will do 8-10 minutes of stand up to prove why he or she should take home swag from Blue Pants Brewery beer! This show is not about winning though; it’s about up and coming comedians displaying their talents. These are comics that are working hard every week to keep audiences laughing. If you’re a comic who is interested in being a part of this show please send video and references to Lucy@StandUpLive.com a month in advance, as this show is PRE BOOKED and not an open mic!